I don’t know if I’ve said it in this context before, but those familiar with my movie tastes know that I’m a generally impartial fan of disaster movies. 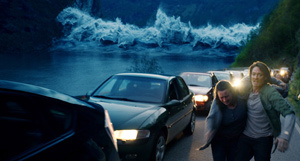 So it was with more than the usual anticipation that I watched The Wave, a Norwegian entry into the kind of wanton destruction only nature can deliver. The first thing to know is that The Wave takes place far from any beach. The movie involves the separation of a massive chunk of rock from a cliff wall. This huge mass of rock and debris plunges into a fjord. As a result, a 250-foot towering wall of water surges through the fjord, overwhelming the small town of Geiranger. We’ve already had a serious tsunami movie (The Impossible). We don’t need another, so director Roar Uthaug takes a different tack. He focuses on geologist Kristian Eikjord (Kristoffer Joner), a dad who works at a mountain station that monitors seismic activity in the cliff wall. Kristin seems to like his job, but he’s about to give it up. He has taken a position with an oil company, which offers a higher salary and more stability in a less remote part of the country. At the last minute before the move, Kristian decides not to take his two kids (Jonas Hoff Oftebro and Edith Haagenrud-Sande) to the city, but to stay in Geiranger until he can shake the feeling that big trouble looms. Kristian’s wife (Ane Dahl Torp) already had agreed to stay behind in order to complete her work at the town’s hotel. I don’t suppose I need to tell you that all hell breaks loose, and that husband and wife, each with a different child in tow, are separated. The actors are likable enough to create the level of concern this sort of picture requires; the effects are good; and director Uthaug creates some nail-biting tension, particularly in scenes staged in the depths of a mountain fissure. None of this is to say that Uthaug totally avoids the cliches that weaken every Hollywood disaster movie. There’s the usual tension between commercial concerns and life-saving procedures — albeit in a lower key than usual. Worse yet, the movie’s slide of rock is accompanied by an equally dense cascade of improbabilities and an unfortunate, last-minute bow at the altar of uplift. OK, so The Wave won’t be anyone’s perfect movie, and it’s not nearly as morally ambiguous as Ruben Ostlund’s Force Majeure, a Swedish film about a family torn apart by an avalanche. But as a good, old-fashioned hunk of big-screen disaster, you could do a lot worse than The Wave, say last year’s far more expensive and less involving San Andreas.